South African President Jacob Zuma is likely to end his presidency the same way he started it: mired in corruption charges. The ANC's parliamentary majority has allowed him to survive each of those votes, but the latest one, in August, gave him a lean margin of 198 to 177. Since Zuma was replaced as head of the ruling party in December, the ANC has turned against him, and a looming no-confidence vote scheduled for February 22 may succeed — if the ANC leadership doesn't convince him to step down first. FILE - President Jacob Zuma gestures as he addresses the parliament in Cape Town, South Africa, Nov. 2, 2017. Deputy President Cyril Ramaphosa, who took over as party leader when Zuma's term expired, this week met privately with Zuma after a series of high-level party meetings that did not produce Zuma's resignation. 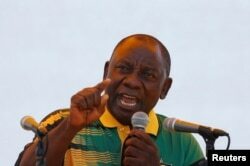 "This is a challenging time for our country," Ramaphosa said in a statement this week, after the nation's parliament took the surprising and unprecedented step of postponing the annual State of the Nation address, originally scheduled for Thursday. "Both President Zuma and myself are aware that our people want and deserve closure." Whenever he does leave office, the outgoing president is unlikely to enjoy a quiet retirement. In recent months, the charges that were dropped nine years ago have threatened to resurface. Last year, the nation's Supreme Court upheld a High Court decision to reinstate the charges, which include 783 counts of corruption over a $2 billion arms deal in the late 1990s. The national director of public prosecutions, Shaun Abrahams — long seen as a close Zuma ally — now has to decide whether to reinstate the charges. Separately, Zuma faces an investigation into his actions with a powerful Indian family that is accused of unduly influencing South Africa's government. And so, says analyst Daniel Silke, director of the Political Futures consultancy, Zuma's future looks cloudy. "The future for President Zuma is indeed going to be rocky," he told VOA from Cape Town. "It's highly unlikely that he'll be able to strike any sort of deal which will prevent the legal process from attacking him. ... This is going to be an expensive business for Jacob Zuma and, of course, the investigations going forward in the courts could potentially uncover even more wrongdoings, or alleged wrongdoings from the president." 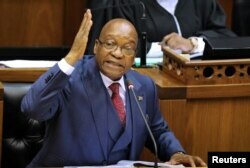 But that, Zuma's detractors say, is not the only reason to remove him. South Africa faces general elections in 2019, when Zuma's second term is scheduled to end. In recent municipal and national elections, the ruling party has steadily lost ground as Zuma's popularity has fallen. In 2016 municipal polls, the party lost control of three major metropolitan areas. With just over a year before the national elections, ANC leaders are aware they need to act fast to keep voters backing the party that has, for so long, dominated national politics. "We were saying to President Zuma on Sunday that we don't want two centers of power; we want President Ramaphosa to take control not only of the ANC‚ but [also] the affairs of the state," ANC treasurer general Paul Mashatile told investors earlier this week at an annual mining industry gathering in Cape Town. "Our view as the leadership of the ANC is that the sooner the president of the republic steps down for the new leadership to take over‚ the better because then you have certainty of policy‚ of direction … there will be no confusion," he said.